Having accounted for the three major categories in the Deutsche Grammophon (DG) box set, Karl Böhm: The Operas (the First Viennese School, Richard Wagner, and Richard Strauss), I must now take the eight remaining CDs into consideration. Three of these are “documents” organized primarily around Böhm himself discussing, in German, his life and work. The last of these is Karl Böhm: Erzähltes Leben (Karl Böhm: A Life Retold). The eight tracks divide his autobiographical account into distinct episodes, punctuated by brief musical excerpts. These excerpts include symphonic music by both Wolfgang Amadeus Mozart and Ludwig van Beethoven, leading (at least) this listener to hope that there will soon be a subsequent DG release of Böhm’s instrumental recordings. More substantial and relevant excepts can be found in a lecture about Mozart’s operas. The disc with this lecture includes two other addresses, one to the press about the 1967 release of his recording of Don Giovanni and the other about his relationship with the Vienna Philharmonic. The longest musical excerpts come from the 1972 Metropolitan Opera Gala, organized to honor the retirement of Rudolf Bing as the company’s General Manager. The two selections honor three of the vocalists who were leading figures during Bing’s tenure. The first presents soprano Teresa Żylis-Gara and tenor Franco Corelli singing the love duet that concludes the first act of Giuseppe Verdi’s Otello. This is followed by Birgit Nilsson’s riveting account of the final scene in Richard Strauss’ Opus 54 “Salome.” Both of these are “gala” performances, aimed more at a festive audience than at an attentive account of the entire opera; but, even in this more festive context, the deliveries of these excerpts never fail to hit the mark at dead center. This CD also includes Böhm’s reflections (again in German) about Strauss and his relationship to the composer. The remaining five CDs account for what might be called the “extremes” of Böhm’s repertoire as a conductor. One is structured around eight arias and one duet from George Frideric Handel’s HWV 17 opera Giulio Cesare with Dietrich Fischer-Dieskau singing the title role of Julius Caesar and Irmgard Seefried singing role of Cleopatra. The ensemble is the Berlin Radio Symphony Orchestra. Let’s not try to kid anyone here. This is an account of Handel that will probably drive those with a serious commitment to historically-informed performance up the wall. Anyone that well informed about Handel will know that the role of Caesar was written for an alto castrato; and, if there is any good news about this recording, it is that we do not have to listen to Fischer-Dieskau demean himself by trying to sing falsetto! This album is probably the result of a decision made in some board room having more to do with DG’s balance sheets, rather than giving Handel the treatment he deserves. Fortunately, Fischer-Dieskau redeems himself more than sufficiently on the CD on which he sings Mahler’s settings of texts by Friedrich Rückert, both the five Kindertotenlieder songs and four of the songs originally published in the Sieben Lieder aus letzter Zeit (seven songs of latter days) and subsequently included in the Rückert-Lieder collection. Böhm conducts the Berlin Philharmonic on all nine of the tracks; and, given how much attention this collection gives to Strauss, this nod to Mahler has much to appreciate, however brief it may be. This CD also has a final track presenting Johannes Brahms’ Opus 53, known as the “Alto Rhapsody.” The alto is Christa Ludwig; and the male chorus consists of members of the Wiener Singverein, all performing with Böhm leading the Vienna Philharmonic. Since this collection already offers impressive accounts of choral music by Mozart, Joseph Haydn, and Beethoven, the inclusion of the Brahms selection is welcome indeed. Most interesting, however, is that the collection also includes Alban Berg’s two operas, Wozzeck and Lulu. Both of these are impressively intense. 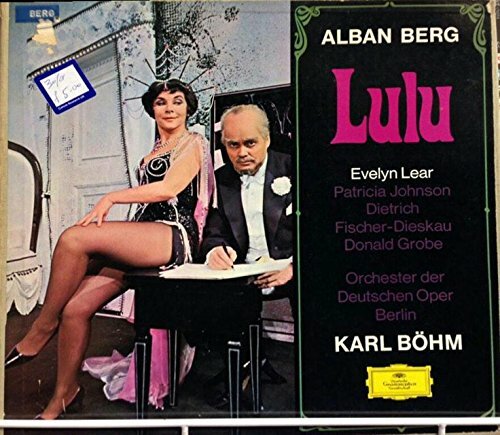 Böhm seems to have put the full extent of his understanding into both operas and has elicited just as much understanding from the leading vocalists in both operas, who happen to be the same on these two recordings. Fischer-Dieskau sings the title role in Wozzeck and Dr. Ludwig Schön in Lulu; and he is joined by Evelyn Lear singing the title role in Lulu and Marie in Wozzeck. The only down-side is that the Lulu recording was made in 1968 and thus predates the publication of Friedrich Cerha’s three-act version, which was published in 1979. It is unclear whether or not Böhm ever examined Cerha’s score, but it would appear that he never prepared it for either performance or recording. Given the intensity that he brought to what has been recorded, I, for one, wish that a recorded legacy of Böhm’s approach to Cerha’s score was available.